Official artwork of Heihachi from Tekken Tag Tournament 2. Heihachi Mishima (三島 平八, Heihachi Mishima) is a recurring antagonist from the Tekken universe. Heihachi Mishima is a major antagonist in the Tekken series of fighting video games, and the archenemy of his son Kazuya. He was born to Jinpachi Mishima, a renowned martial artist and the founder of the Mishima Zaibatsu corporation. Heihachi overthrew and murdered his father in order to take control of his company and begin a criminal empire. He soon bore a son, Kazuya Mishima, but found him to be weak and threw him off of a cliff in order to test his strength when he was five years old. Years later, when Heihachi hosted a martial arts tournament called the King of the Iron Fist, Kazuya returned in order to exact revenge on his father. Kazuya defeated him, threw him off the same cliff, and assumed control of the Zaibatsu, continuing his father's criminal practices. Heihachi would later return and retake control of his corporation by defeating Kazuya in the next King of Iron Fist tournament and dropping him to his death into a volcano; it was around this time that he discovered that his son had been saved by a Devil Gene, and he now seeks this in order to attain ultimate power, going so far as to manipulate his grandson, Jin Kazama, who also bears the Devil Gene, into entering a new King of Iron Fist tournament 15 years after the last one in order to obtain the power of an ancient battling deity known as Ogre, whom Jin wanted to defeat to avenge the supposed death of his mother, Jun Kazama. While Jin came out victorious, Heihachi immediately ordered Tekken Force, the Mishima Zaibatsu's private paramilitary squad, to murder him, with Heihachi delivering what would be the killing shot, were it not for the Devil Gene within Jin awakening in the nick of time and saving him from certain death. Two years later, as Heihachi attempted to have a new lifeform created based on Ogre's DNA samples taken from the site of his battle with Jin, he discovered that a sample of the Devil Gene was necessary to do so; around this time, he learned that Zaibatsu rivals G Corporation had exhumed Kazuya's corpse and successfully brought him back to life, and so he decided to organize a fourth King of Iron Fist tournament, with the Zaibatsu as grand prize, in order to lure both Kazuya and Jin in, in which he succeeds, leading to a battle at the shrine of Hon-Maru, in which Jin, powered by the Devil Gene, defeats both his father and his grandfather, but spares them both in Jun's name. Soon after Jin vanishes into the night, a squad of JACK robots, deployed by G Corporation, break into the Hon-Maru in order to capture both Mishimas. Heihachi seemingly perished in the explosion after being left to die by Kazuya, but he resisted and went into hiding, reappearing one month later when the fifth King of Iron Fist tournament is announced. He also enters the sixth tournament in order to take the Zaibatsu, which had been taken over by Jin at the end of the previous tournament back for himself. It is later revealed how everything came to be: years ago, he met his then-future wife, Kazumi, who had been sent to train under Jinpachi Mishima, Heihachi's father, and with time she and Heihachi fell in love, got married and had Kazuya. However, one day, Kazumi confronted Heihachi, by saying he would one day become a threat to the world, and revealed that her real intentions in marrying him were to murder him on behalf of the Hachijo clan. As they fought, she manifested Devil powers, and Heihachi had no other option but to kill the only woman he ever loved. After recounting these events to a mysterious journalist, Heihachi goes off to confront Kazuya one final time at the mouth of a volcano. The duel ends with Heihachi's death, and his body being dropped into the boiling lava by Kazuya, repaying Heihachi a second time. Barring Banjō Ginga in the first and second Tekken games, Daisuke Gōri was famous for providing his voice in subsequent titles, until Tekken 6 as he passed away on January 17, 2010 with Unshō Ishizuka currently voicing him as of Tekken: Blood Vengeance and onwards until his passing, in August 13, 2018. A Mii Brawler dressed as Heihachi. Heihachi was briefly considered as a possible playable character, according to an interview with Masahiro Sakurai. He was passed over in favor of Pac-Man as a Bandai Namco representative, at least in part because Sakurai considered the idea of implementing his moveset in Smash to be difficult. Heihachi is the basis for a paid downloadable content costume for Mii Brawlers. The costume resembles Heihachi's rejuvenated appearance that debuted in Tekken Tag Tournament 2. It was first shown at the end of Ryu's reveal trailer, with Ryu and a Mii Brawler with the costume attacking each other simultaneously, referencing how Heihachi and Ryu had previously appeared together in the crossover titles Namco × Capcom, Street Fighter X Tekken and Project X Zone. Heihachi's appearance in Namco Roulette. While Heihachi no longer appears as a Mii Fighter costume, he instead cameos in pixel form during Pac-Man's Namco Roulette taunt. 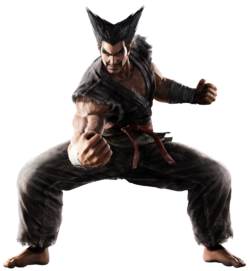 The sprite is taken from Tekken Tag Tournament 2, and is based on his gray-haired appearance from Tekken 3 onwards. Heihachi and Link both appeared as guest characters in Namco's SoulCalibur II in the PS2 and the GameCube versions of the game, respectively. Cloud Strife was almost the PS2 guest, but was replaced with Heihachi at the last minute. This page was last edited on April 20, 2019, at 01:50.